As an event planner, you know how important it is to mix things up. So why not consider taking advantage of what makes our area so special. Our charters offer all the benefits of landlubber locations, but with a boatload of features you won't find in your typical event space. There's a lot to be said for being out on the water -- the waterscapes and city skylines, the simple joy of skimming along the water and feeling one with the natural environment, and that it's an adventure. But there's more. One of the main reasons to host an event is to help people get to know each other. That means you've got to create the right atmosphere. Well, that's just built into the boating experience. There’s a feeling a person gets when they step onto a boat. For just a little while, they're joining in a private adventure. 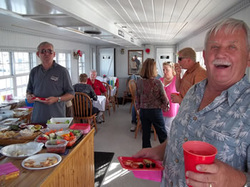 People tend to talk to each other more, passengers chat up the crew and learn about their lives at sea -- maybe they're former Alaska fishermen, blue water sea captains or long-distance sailors.